About author: Worked in African countries since 2006 as Director-Grafax Cotton Pvt. Ltd. and had been supporting International Red Cross and other NGOs as volunteer on Basic and Advance Life Support. We are connected. All of us on this sole living planet. Ebola challenges the chain of survival and contacts. It shocks and wakes up humanity. Imagine a biological bomb. No one knows how to diffuse it. Those who come closer become suspects. Ebola viral multiplies and has no cure. A `saver` or life support person becomes an `enemy`. Science and humanity both stand helpless. Such is the magnitude of crisis in few West African countries hit by Ebola. The Cure in Reel Life but not in Real life : Ebola outbreak is real. Not a 1995 Hollywood film-`Outbreak` based on a Medical Disaster, inequality and bribes in a system. In Outbreak, the American hero- Dustin Hoffman explores a cure for the fictional Ebola type virus (Motaba) that instantly cures. 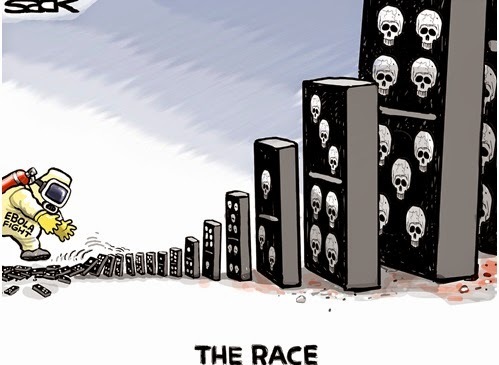 It is not strange that a Viral as a War has raged on for over past 40 years in poor African countries with no cure. Today rich countries with Business in Ebola countries are ready to spend thousand times. Reason ? Ebola has crossed Africa and has reached their doors. Real Life : What goes wrong in Ebola Control ? Ebola a 40 years bedrock with more than 24 tides sustains due to unequal global treatment expenditure.US spends $8,362 annually per person on health while several poor countries hardly spend 12 dollar to 20 dollar per year per person. Ebola control requires at least one million dollars each day for safe screening of a hospital of say 70 beds. Every country wants to do business for profit with West Africa but no one dares to improve standard of human living. It there are 26 doctors on each 10,000 people in safe US then there are one less than one doctor in several African countries. American Researchers demand $1 billion for breakthrough and has got a third of it in actual paid donations from all the nations. Question remains as to why does it cost $1 billion to develop an anti-Ebola drug, while India or Cuba can easily be encouraged to achieve the breakthrough on the same health indicators and molecules by spending 40 times less. 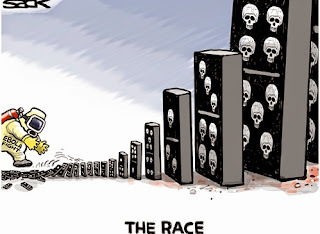 How America differs from Africa in Death Rate Race ? Death rate for Ebola suspects in W Africa is approximately 75 per cent while Ebola death rate in US is 11 to 20 per cent .America announced two Ebola death with ten patients under treatment. One Ebola case airlifted to US died had his diagnosis severely delayed and the treatment came too late. Why different death rates when all share the same virus on the same planet ? US annual expense on per person health is almost 800 times more than the poor countries. How doctors stand divided on Isolation of 21 days ? Many Ebola health workers who return back to US are imposed with quarantines of 21days. Suspects never volunteer themselves for Ebola test while Ebola will continue to find its own hidden ways to spread. Global healthcare lobby clearly stand divided on 21 days. Question which authorities dodge is why not 22 days why only 21 days? Doctors feel it needs courage and conviction to handle and test Ebola suspects. Few revolt stories and strikes are spilling out when health workers are put to 21 day isolation. Red Cross as media puts admit that 60 percent health workers after visa do not `show up` to travel to Ebola hit countries due to family pressure. Nina Pham Health worker meets President Obama in the Oval Office after her successful 21 day isolation. U.N.Secretary-General Ban Ki-moon recently warned against "unnecessarily" strict restrictions on the movement of health workers who have been fighting the deadly Ebola virus in West Africa while putting their lives at risk. Ebola 21 day isolation generates anger and frustration among suspected poor travellers who complain about detention, bribes and harassments as seen on Social Media. What is the `chain of contact` in Ebola Control ? Chain of Contact as put simple by WHO is the contact of new persons with the effected person. The only way to stop Ebola is to break the chain of contact or transmission. On ground zero it is difficult as one victim can affect hundreds of connected supporters in the chain of suspicion. Lasting impact on Global community once Ebola spread is over ? West Africans are strong people and will definitely bounce back after this disaster. What may remain will be the global emphasis on hygiene and Toilets with real need to reduce gap between rich and poor and between countries. Ebola opens the collective human opportunity for an ultimate test of hygienic practices of washing hands, having clean water, hygienic toilets and prompt cremation. Politicians in developing countries are clever. They grab Ebola global opportunity to become poster boys of cleanliness with no roadmap for garbage recycle, no dignity of work and unequal wealth distribution. Ebola hasn't resulted in total societal breakdown with hope it never will win. In the past Ebola bounced back with 24 outbreaks was limited only to Congo near River Ebola. Only 1716 cases were detected from 1976 to 2013 in West Africa. As this write up gets published,Ebola-2014 will put more then 15150 global suspects/confirmed with after 21 day isolation. Death toll is around 5445 and is still counting. `Hit` suspects are `mobile` with faster modern travel facilities. So outbreak is spreading faster in 2014. Funds for cure and research in time can help outsmart this deadly viral once it slows down possibly near Christmas as stated recently by Dr. Peter Piot co-founder of Ebola Virus in 1976. 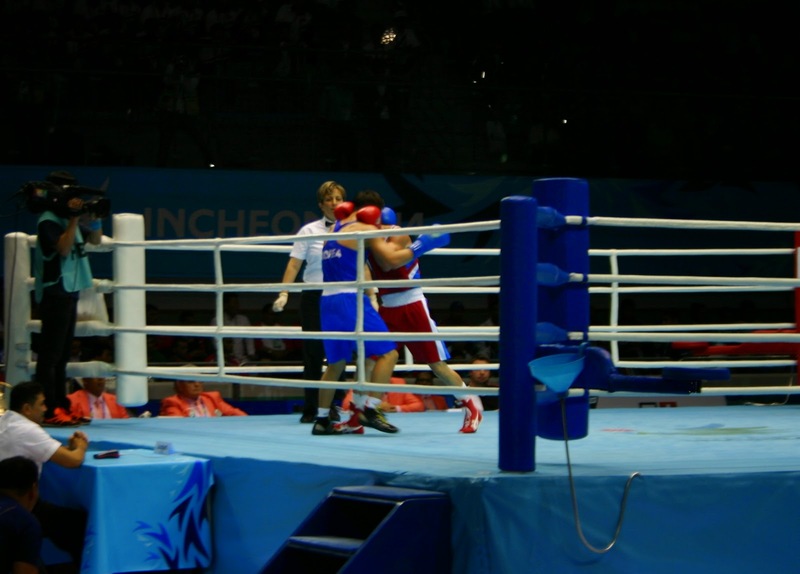 Preliminaries session 5, Men’s Bantam 56 kg and Men’s Light Heavy 81 kg boxing held in Seonhak Gymnasium on September 26, 2014. 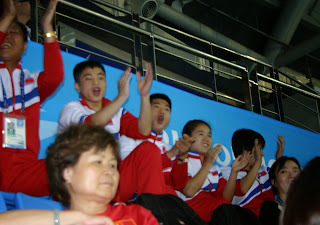 Among them, interesting match was between North Korean Kwon Cholguk and South Korean Ham Sangmyeong. North Korea player is psychically strong and, he feels no hard, compare to South Korean player, who seem weaker during the match. A group of North Korean supports are also cheer and shouted their country man in-spite of full of South Korean audience in the hall. 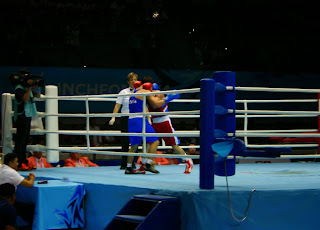 It seems North Korean player beaten South Korean player more times, but the result announced, at the end of three rounds, was won by South Korea, 28/29, just 1 point different. Referee is Hammadi Sidi Yakoub Kheira for Algerian, Judge 1 is Basi Amrik Singh from GBR, judge 2 is Gorny Mariusz Jozef from Poland, Judge 3 is Zoubid Hassan from MAR, Judge 4 is Malyshev Vladislav from Russia and Judge 5 is Silva Do Rosario Jones Kennedy from BRA. The matches on that day are including, Japan and China, India and Pakistan, and so on. Moreover, North Korean football team was not able to beat by South Korean team at the men football final match untill fulltime. 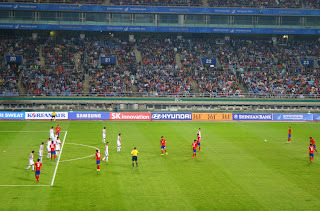 Only at the extra time, in the last minutes, by chance South Korean team was able scored a single goal. 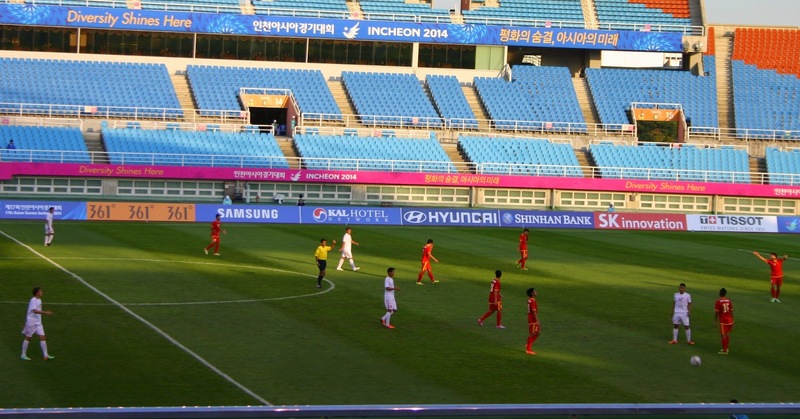 Many surprised that South Korean who used to compete at the World Cup Semifinal was idle before North Korean. Psychologically, North Korean were never able to undermine by South Korean, can’t looking down them. 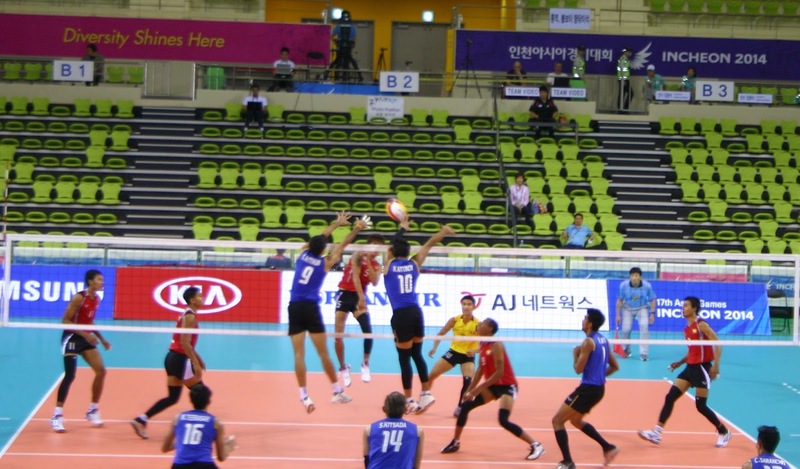 At the 17th Incheon Asian Game, men volleyball match between Myanmar and Thailand was held in Songnim Gymnasium, on September 24, 2014. 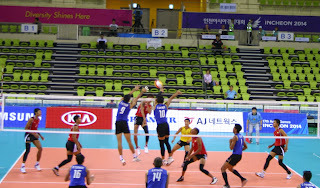 The match ended at the 3rd match with in favor of 3 and 0, won by Thailand. At the first match Myanmar score 14 out of 25, second match 17 out of 25, and third match 20 out of 25, a total playing time is sharply one hour. Myanmar the best Scorer is Aung Thu with 15 out of 38 attacked and speed 107 km/h fastest serve, and Thai the best scorer is Raksakaew Jiraya with 21 out of 43 attacked, more than Myanmar’s counterpart, and his speed is 109 km/h fastest serve, that also more than Myanmar’s counterpart. The first referee is Ho Tat Ming Samuel from Hong Kong and second referee is Cheng Lai Chun from Taiwan. 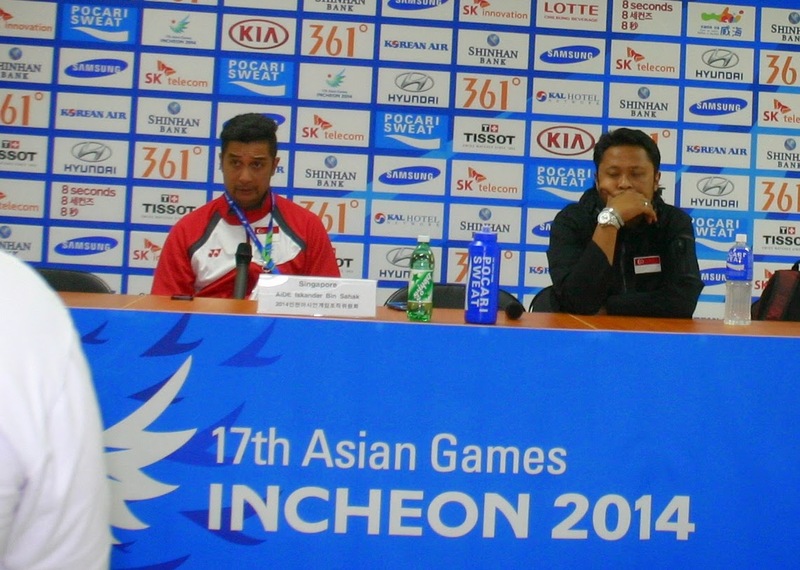 Myanmar coach Nyi Nyi Lwin stayed calm gentleman manner even very hard time of his team. In general, Myanmar sport teams have a difficult situation, training and capacity compare to other, to enter mainstream sports to compete with other advanced countries. 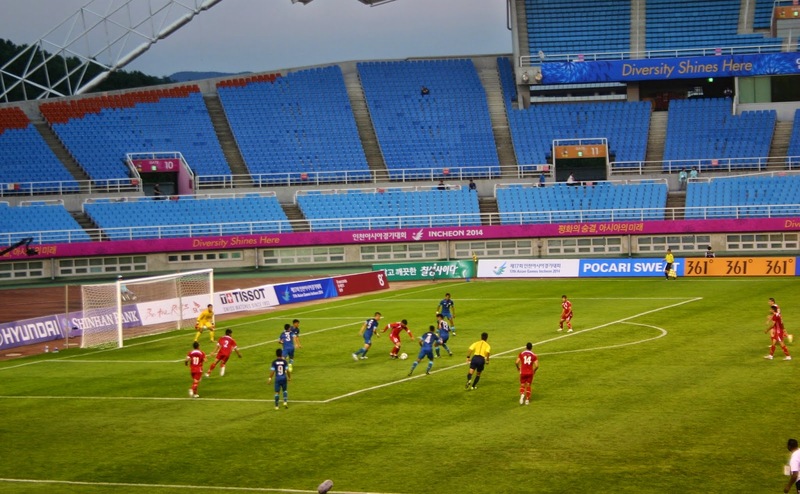 At the 17th Incheon Asian Game, football men first round match between Palestine and Singapore was held at Ansan Wa Stadium on September 21, 2014. Singapore won 2 to 0 against Palestine, Singaporean with red shirt and Palestinian with Blue shirt. Singapore had two goals in the first half match, and no more goal in second half match, and Singapore seemed lower performance in second half. Palestine had a chance to goal in second half match but failed to do it so. The match was tight, both teams have 3 yellow cards each. In this match, the referee is Tojo Minoru from Japan and Assistant referees are Ochi Shinji from Japan and Mu Yuxin from China. 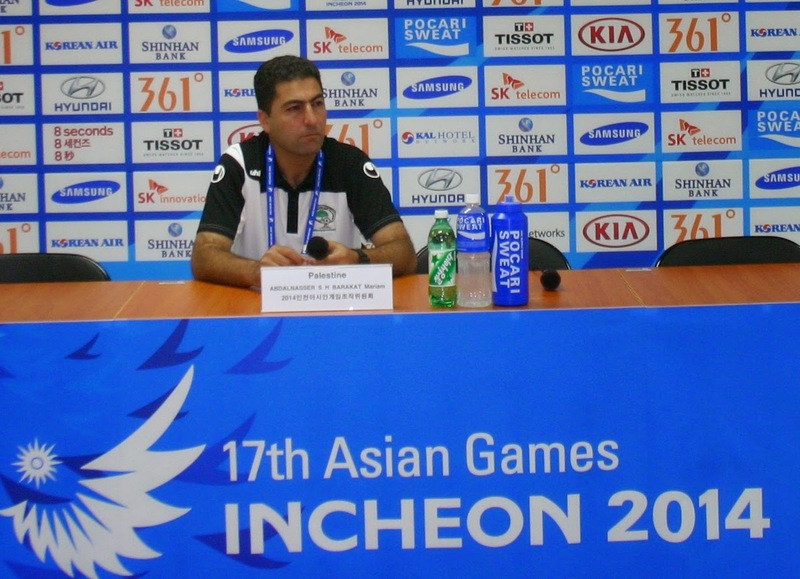 At the press conference, Palestine coach Abdalnasser S HBarakat Morian admits they made two mistakes. Anyhow, Palestinian like football and they like to play and share love to world community. Singapore coach Aide Islandar Binsahak said some of their players are still in school, a few are professional, 8 were already played at SEA game. He emphasized their players are physically small but it is a game of sport spirit. They are confident to compete for the next match. 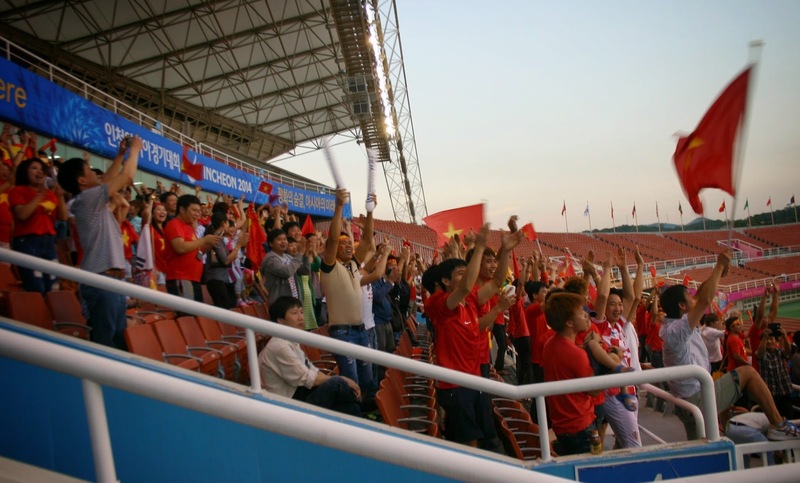 Another match for Football men first round between Vietnam and Kazikistan was also held at Ansan Wa Stadium on September 22, 2014. Vietnam won 1 to 0 against Kazikistan, Vietnamese with red shirt and Kazikistan with white shirt. No goal in first half match either team, Vietnam got a goal with penalty at the second half match. Kazikistan had also many chances to goal but failed to do it so. Both teams are very active and strongly motivated, Vietnam had 4 yellow cards and Kazikistan had 5, respectively. The referee is Tayeb Hassan from Bangladesh and Assistant referees are Ahamed Ferdous from Bangladesh and Al Azawi Luay Subhi Adib from Iraq. 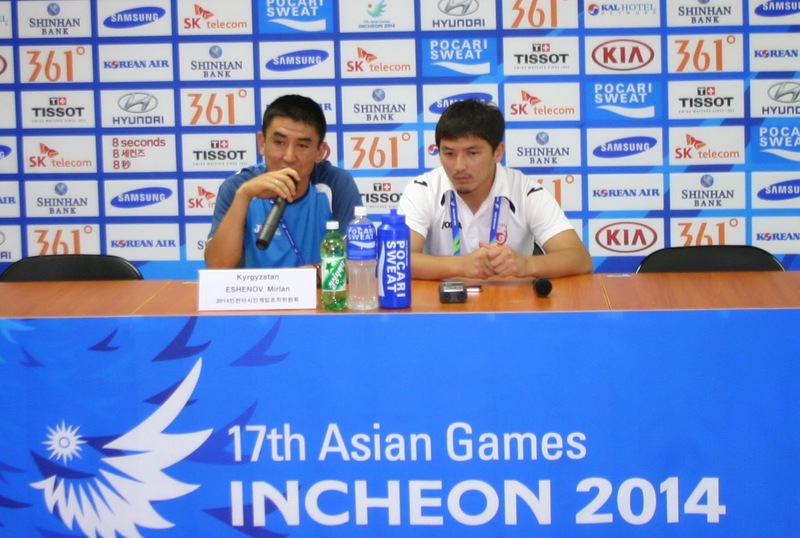 At the press conference, Karyzastan coach Eshenov Mirlan said the game was so pressure one and so excitement. Today they played as a defensive. Since it is football match so they may lost sometime. Karyzastan do play football in their country as a national game for federation. Vietnamese coach Mivra Toshiya said their team was not played well in 1st half, and they are physically smaller than opposition team. However, 2nd half they played well and a better technique and ground ball passing. He doesn’t feel negative toward referee even though he may did a mistake. He believes his team is in medium position in the world’s football status. 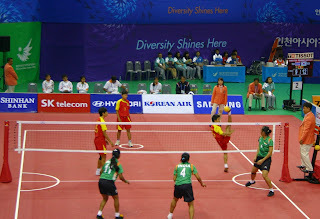 At the 17th Incheon Asian Games, Sepaktakraw women’s team preliminary group B competition between Myanmar and India held at Bucheon Gymnasium in September 23, 2014. 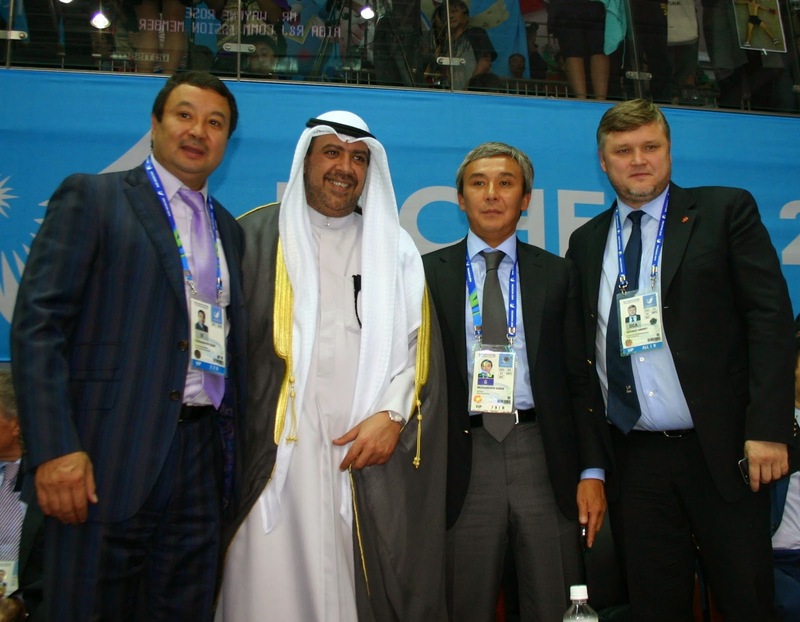 Among attendees, special guest officers from IOC, sepaktakraw’s funs and many supporters came to watch the match. There were three teams from each country for the competition of regu1, regu2 and regu3 respectively. Myanmar's all three women teams won the match against Indian. Number 5 Kay Zin Htut from Myanmar is excellent killer. She could hit the target without missing a single time. Number 3 Kyu Kyu Thin from Myanmar is also excellent Tekong, she made many score by just a good serving cane ball. Myanmar score was continues up and win the game quickly in the 2nd match, and left Indian team less than 5 points out of 21 finish game point. Myanmar women are already won a gold medal for women double match. I don’t think this time, the organizers in South Korea will asked Myanmar women to return back their gold medal. It was a case, Myanmar woman beauty pageant of Miss Asia Pacific World 2014, the winner was asked to return back the crown by organizers in South Korea, after she was awarded for three months. Official referee is Lee Youngik from South Korea. Referees are Hashim Fadzil from Malaysia, Shin Wooshuk from South Korea and Pattanamas Phisist from Thailand for each matches. Court referees is Kwo Mikyu, Park Jonglyoul and Kim Minjin from South Korea for each matches. 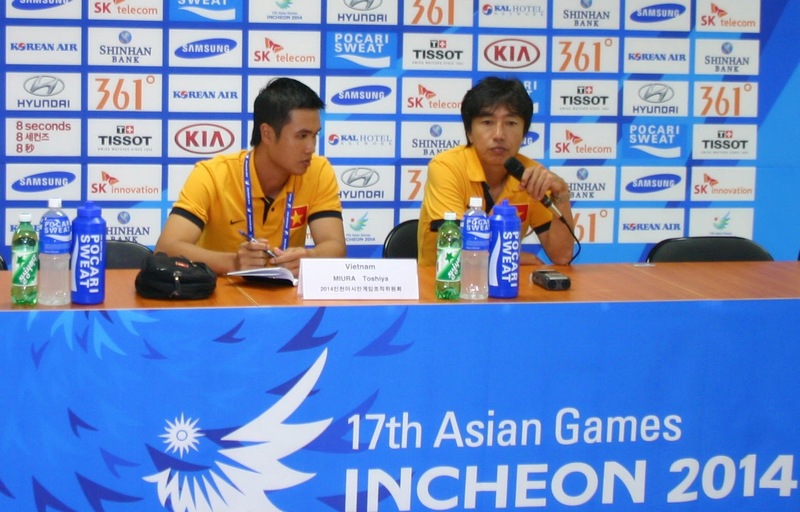 Assistant Match referees are Cho Younghyun, Choi Yeonjae and Kwon Minkyu from South Korea for each matches. 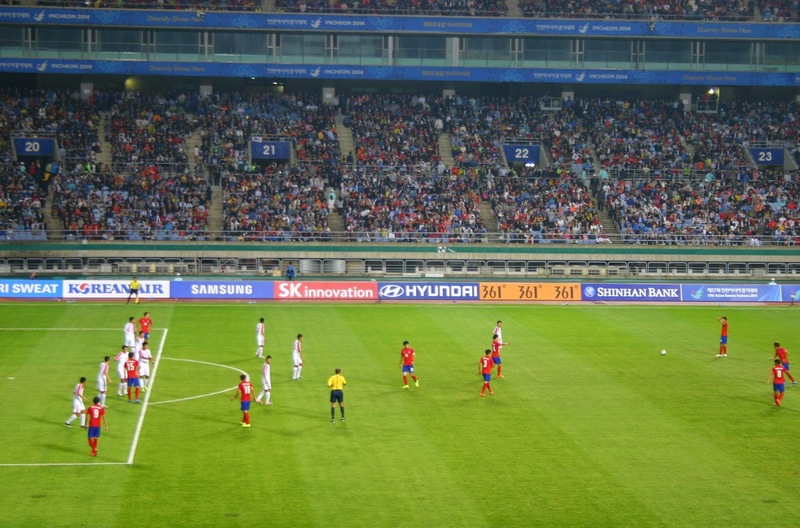 Line Referees are Jeong Hundai and Seo Kyongwon, Kim Youngkyung and Choi Hakseong, and Jeong Hundai and Seo Kyongwon from South Korea for each matches. Sepaktakraw is also known as Chinlone in Myanmar, it was one of Myanmar traditional sport. Nowadays, it becomes popular in Asia, many people who watch the match were really fun by this sport. Surely, it will become an international sport. (Trumbull, CT: September 6th, 2014): Indian Americans continue to come in large numbers and settle down in the state of Conne4cticut particularly in towns with reputations for excellent schools. The latest figures from the U.S. Census show 37,545 people of Indian origin living in the state, an increase of about 14,000 from 2000. In the last five years since the last census, there has been a very significant influx of Indian Americans in the Constitution state. The reasons to move here, Indian Americans say, remain education and opportunity. This fast growing presence of the Indian American community was evident when nearly three hundred people from across the southern state of Connecticut came together to participate in and cherish their rich cultural heritage and be part of the annual Onam celebrations organized by The Malayalee Association of Southern Connecticut (MASCONN) on Saturday, September 6th, 2014 at Madison Middle School, Trumbull, CT. The more than four-hours long cultural extravaganza was in many ways “reliving the culture and traditions” and a “cherishing the past with a view to pass it on to the future generation.” Living in countries that are far away from their homeland, in the midst of different cultures, busy with the day-to-day mundane work and home tasks, the Non Resident Indian (NRI) community made this "land of opportunities" their home, have brought with them these cultural traditions and have sought to pass them on to their children, who are often born and raised here. In his Onam message, Dr. Babu Joseph, a visiting professor from India told the audience that the “beauty of the festival lies in it's secular fabric. People of all religions, castes and communities celebrate the festival with equal joy and verve. Onam also helps to create an atmosphere of peace and brotherhood by way of various team sports organized on the day.” He added. 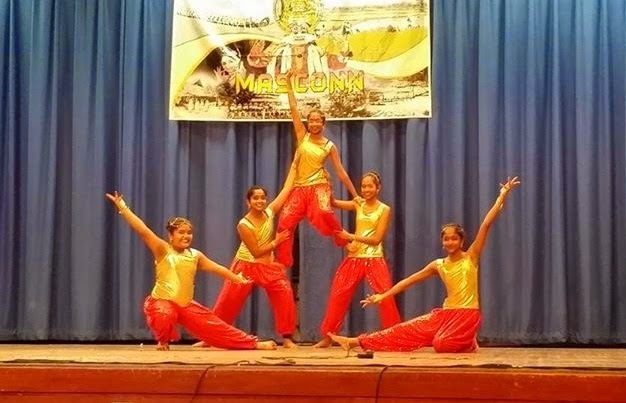 “MASCONN an offshoot of the natural growth of the Indian-American especially Malayalee Community in the southern Connecticut region,” said Giby Gregory, president of MASSCON, in his welcome address. “In a very short period, we have grown by leaps and bounds and we strive to meet the growing needs of our community.” Legendary King Mahabali was welcomed to the stage with pancha vadyam and a warm traditional welcome by Mini Ajay, Mini Joji, Erin Denny, Suja Krishnan, Leena, Buela John, Vineetha Sujanan, Smitha Mathew, who later on performed Thiruvathirakkali, a folk dance, typically a Keralite dance, well known for its essence, grandeur and simplicity. In this traditional dance form, women clad in traditional Kerala attire with gold brocade attached to it and wearing jasmine garlands on their heads, rhythmically moved around a lighted Nilavilakku, singing and clapping their hands, to the tune of a particular genre of songs called Thiruvathirappaattu, which is meant solely for this graceful dance. The Global Digest has interviewed with Electric Run sport organizers in Seoul. According to Electric Run, Sooyong Son and Bruce Lee, it was started 2 years ago in US, in 2012, it’s a combination of running and music program, especially, for marathon race. It can also include dancing. At the event, there are usually 7 or 8 lands. When you go in the land, lighting and various performances will displayed. Each land has different tool and machine, such as different light color, music, electric rain forest, moving umbrella and so on. Power house will be at the finish line. People can take picture for themselves. The program will starts after 30 minutes sunset, there is wearing up at the pre-event. After your registration for the program, you will received runner package, a T-shirt and land glass, so on. In Seoul's event in October 5, there will be 7 lands available, it has 5 km long, approximately, it will takes 30 to 40 minutes by run, an hour for walk, said Bruce Lee, manager of Electric Run Korea. The organizers expected 12,000 people will be participated out of 15,000 capacity. The organizers also invited students from 5 universities in Seoul. Running is increasing in South Korean's society nowadays. They have 200 marathons a year. The concept is people to come out with their friend or family and enjoy it, including kids, no time challenges, said Sooyong Son of Parallel Media Group. It’s a kind of community activity or exercise, as well as, for health. This is not just competition, they can have enough fun, he added. Usually, in Korea, 6-7pm, people have nothing to do and stayed idle. Electric run program is also better than sitting at the bar. Moreover, after finish ruining, the last excitement program prepared to get excitement until you get home. Ten of thousands of runners, walkers and dancers will set the parks around Seoul World Cup Stadium aglow on October 3rd (and Busan TBC on October 10th & 11th) when Electric Run arrives in Korea. The Worlds Brightest Nighttime Fun Run Experience takes runners on a high-energy journey through an electric wonderland, featuring over a million watts of light and sound. Beginning in the US in late 2012, Electric Run is a next generation fun run experience which features a premier lighting show, top entertainment and an energized crowd, many of whom come dressed in their glowing, dazzling best. 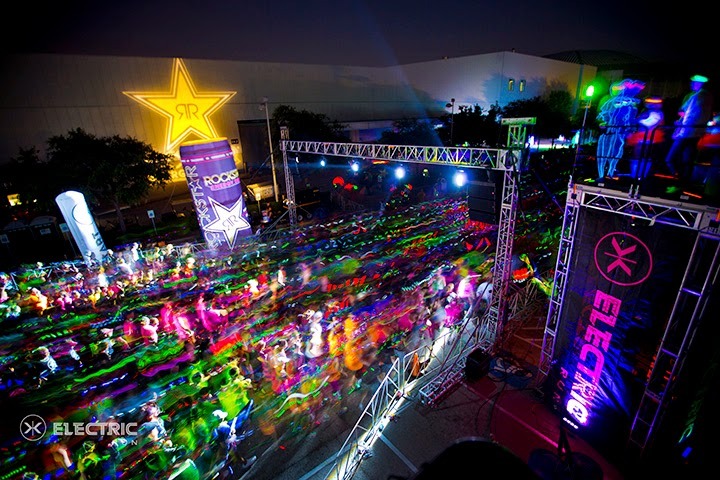 Electric Run is like no other run. It is family-friendly and has attracted over 300,000 participants across America, including Vanessa Hudgens, Carmen Electra, Juan Pablo Galavis, and Seth Rogan, with the phenomenon now going global with sellouts already in Sydney, Amsterdam, London, Singapore and Tokyo in 2014. Runners are taken on a journey through seven unique lands, transporting them to different worlds with a mystical, theatrical and high-octane light show to ignite the imagination. These brightly colored fantasy lands are known as Electro Rainforest, Pillar Party, Neffmau5 Land, Electric Avenue, Rainbow Road and The Powerhouse, immersing runners in a one of a kind light show before arriving for the Finish Celebration, where the sensory overload continues. Here, a DJ headlines the party with a set to keep the runners reveling. Electric Run is partnering with local events organizer PMG Korea for the inaugural Korean legs of Electric Run. “We are proud to be part of this event which is going to be an unforgettable experience for people of all ages. There has been great demand from consumers for new and more exciting forms of entertainment and Electric Run and fits right in with PMG’s portfolio of major concerts, arts and sporting events.” Says Sonia Hong, CEO of PMG Korea. TICKET INFORMATION - Ticket Registration Opens 8pm, July 3rd. Standard Entry is W55,000; EARLY BIRD - ￦45,000 , July 3rd 8:00 pm ~ July 5th 11:59 pm; Advanced - ￦50,000, July 6th 0:00 am ~ July 19th 11:59 pm; General -￦55,000, July 20th 0:00 am ~ September 30th 11:59 pm. (The participants who register after September 20th have to pick their pack at the venue). Deluxe Entry is W80,000 (Groups registering 4 or more people will get W3,000 discounts on tickets). Kids 7 and under are Free. 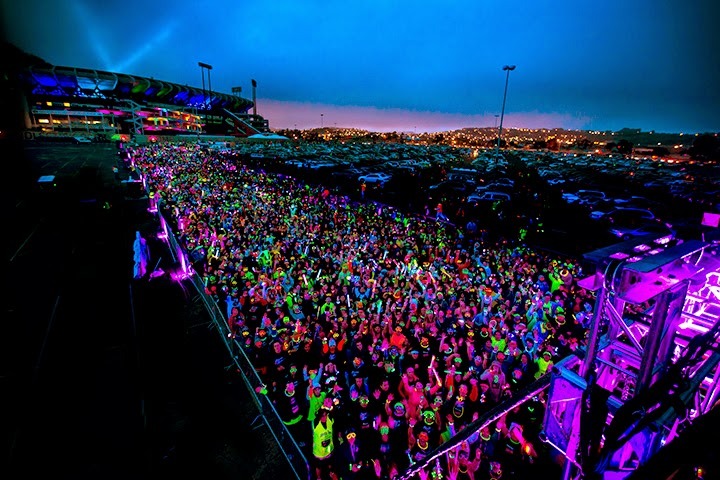 Visit http://electricrun.kr to purchase tickets and merchandise. Electric Run Korea Official online ticket provider: Korean website http://www.11st.co.kr/html/nc/event/electricRunEvent.html, English website http://english.11st.co.kr/en/browsing/EventPromotion.tmall?method=getEventPromotion&dispObjNo=8218701. South Korea based 2014 R16 KOREA WORLD FINAL held in Olympic Hall, Olympic park, Seoul City, South Korea, from July 4 to 6. Approximately, 1000 people from around the world attended. 2014 R16 KOREA WORLD FINAL winners are: Out of 16 solo competitors, Solo Bboy Final goes to Issei from Japan, he is a 2 times Champion, against LIL ZOO from MOROCCO, a Special Invitee who was believed to able to defeat Issei, in-spite of interesting his performance, somehow at his extra times performances were short enough to judges to give scores. B-boy Judges are LIL G from VENEZUELA, BENJI from FRANCE, DIFFER from KOREA, STORM from GERMANY and ASIA ONE from USA, the only lady judge. Out of 8 crew competitors, Crew Bboy Final goes to GAMBLERZ CREW from KOREA, R16 Korea Crew Champion, against PREDATORZ CREW from RUSSIA, a R16 Slavic Crew Champion. Initially, audience taught Russia crew is the winner however judges nominated a Korea crew. Korea crew had also deadly fight with SKB CREW from AUSTRALIA, R16 Oceania Crew Champion. Out of 8 solo competitors, Solo Locking Final goes to Cio from Japan, against her husband MASATO from JAPAN as well, he is a R16 Japan Locking Champion. It was a kind of family fight for championship. Locking Judges are SUGA POP from USA, YUU from JAPAN and HA from KOREA. Out of 8 solo competitors, Solo Popping Final goes to Kidbo from US, against SALLY SLY from FRANCE, R16 France Popping Champion. Popping Judges are POPING PETE, MR. WIGGLES and SUGA POP, all of them are from USA. MC repeatedly emphasized at the event, by shouting the word “respect” toward the competitors. Both MCs GO and SNIPA are KOREAN. 2014 R16 KOREA WORLD FINAL was concluded with a Live Act by a singer JAY PARK, original from KOREA later he moved to US. 2014 R16 KOREA WORLD FINAL DJs are BLESONE from USA, LIGHT from JAPAN, WRECKX from KOREA and KAISTAR from USA. LIVE BAND is R16 WARSAW BAND from POLAND, they played last year as well. According to PR Agency Snowball Communications, R16 KOREA WORLD FINAL is one of major B-boy festival in the world. The R is for R-E-S-P-E-C-T, R16 KOREA World Champion Ships is title for b-boy top of the world. R16 KOREA WORLD FINAL takes place every year and it becomes bigger than last year. R16 Korea is an annual global b-boy tournament and urban arts cultural festival. The main event features solo and crew b-boy battles. Over twenty R16 Championships take place in numerous countries around the globe to determine the competitors for the World Finals, taking place in Seoul, South Korea. The week-long World Finals festival includes graffiti artists, streetwear designers, Hip Hop concerts, popping battles, locking battles, other performances and multimedia experiences. “Respect” is the enduring theme that makes the “R” in R16, and the R16 World Finals Championship is one of the most respectable sought-after titles in the street dance culture. As a street dancer, holding the R16 title opens up numerous opportunities worldwide. The first R16 took place in 2007 and the event has since encompassed all aspects of urban youth cultures; taking the street movement to a higher level.